Ricky Ricotta and Mighty Robot are not allowed to watch television. They have arrived late for dinner for the third time in a week and Ricky's parents have decided to ban TV until the two friends can learn to be a little more responsible. Little do they know it is a very good thing not to be watching television this particular evening. On Venus, an evil vulture has been hatching a plan to get off the horribly hot planet and make a permanent move to earth. And when his Voodoo Ray was beamed down and picked up by the TV signals, everyone on earth was hypnotised by Victor Von Vulture – all except our two heroes who could not watch television. And so his evil plan to get earth's population to bring food to him and his Voodoo Vulture army appears to be a smashing success! Only two people stand in his way: Ricky Ricotta and Mighty Robot, who must hatch a plan of their own to stop the vile vulture. 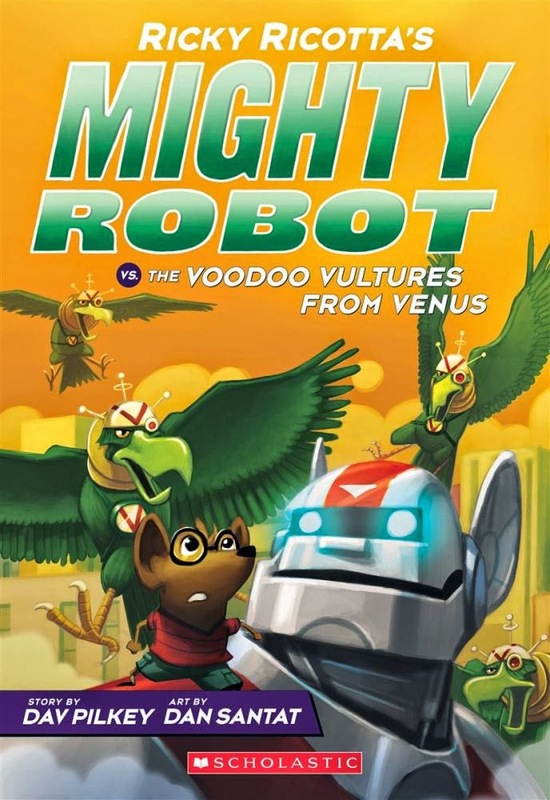 This is the third book in the action-packed, funny Ricky Ricotta's Mighty Robot series for young readers. The alliteration and imaginative silly humour is entertaining to read and the bright glossy illustrations enhance the frenetic pace of events while mini-comics and flip-o-rama's add to the craziness of the book's plot. Towards the end is a great illustration of the jail which is starting to fill with all the villainous masterminds from previous books that Ricky and his robot have thwarted. I'm sure there will be plenty more.